With WebARX you can generate a website security report for each website you secure and monitor. You can find the reports if you log into your account and look for Reports – Generate Site Reports from your left-side menu in WebARX Portal. With security reports, you can easily send a security overview of a website to your clients or company. What kind of information is on a website security report? At the top of every website security report, there is a table, which will show you how many attacks the WebARX web application firewall has blocked during the week the report was generated for. On the right side, you can see the top 5 types of traffic which were blocked during the week. WebARX has an uptime monitoring feature, which will alert you if the site is experiencing downtime. Every website experiences downtime, but it is important to keep uptime as high as possible. On the website security report, you can see the status code, the description, response time and date of the detected downtime issues. Security scan will give you information about any critical issues and improvements that can be made on the site. Under passed you can see different checks which we constantly monitor and are properly set up. Under outdated/vulnerable software you can see if any of the plugins or software on the site are outdated. You can see the software name, current version and the new version available. Additionally, you can see if the software or plugin has any vulnerabilities or if it is outdated or not. How to generate a website security report with WebARX? Click on a site in the list of your website(s). Pick the week that you want to generate a report for. Get the link for downloading or use the link to share it right away. If you choose to send out an URL of a report then it is important to know that the URL is valid for 1 week after it has been generated. For permanent report, you should choose to download a PDF to a local drive. How to generate a white label security report with WebARX? Having a white label option is good when you are monitoring and protecting your customers’ sites and want to send a report with your agency or company logo. For the white label option, you need to specify the URL to an image that should be displayed on the top-left corner of your security report. A recommended ratio of the image is 10:1, such as 600 width x 60 height pixels. Click on a White Label tab on your Security Reports page. Paste your logo URL into the field and click Save. Go to the Security Reports tab. Which WebARX plans get security reports? WebARX website security reports are PRO and Enterprise plan feature. White label option is in default only in Enterprise plan. If you have a PRO plan and want to get white label options, you can add it to your account as an add-on for $1.49 per site/per month. It can be done easily in the Billing section in WebARX portal and will be added to your next month invoice. 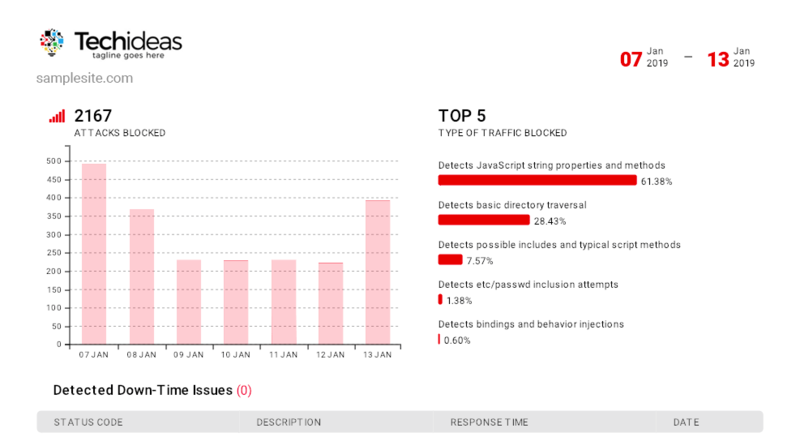 Here you can see a website security report example part of a WebARX white label report. To get started with WebARX you can make an account here.